Pixie caps, beardies, greenhoods and flying ducks … New Zealand’s orchids have vivid names, but it is easy to overlook these small perennials. Nature lovers can find them in a wide range of habitats, from swamps to forests to alpine herb fields. Next time you walk in the forest or beside a swamp, look for a native orchid. Spring and summer is the time to find them on dry clay banks. They have unusual flower shapes and grow everywhere in New Zealand, but are not always easy to find. Orchids are long-lived flowering plants with unusual flower shapes. Many die down to an underground stem after flowering each year. New Zealand has over 120 species of wild native orchids. Eight species are epiphytes. These are plants that perch on trees or rocks. The bamboo orchid grows in the fork of a tree, and has starry white flowers in summer. In tropical countries the flowers are big and showy. In New Zealand they are mostly small and not brightly coloured. 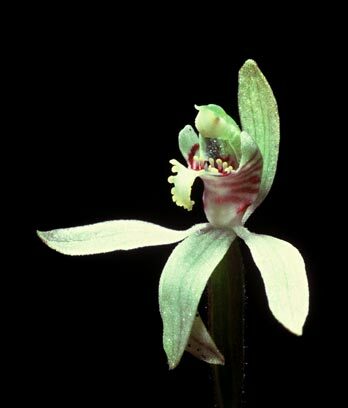 They are often named for their odd shapes, such as the spider orchid, helmet orchid and duck orchid. The middle petal of an orchid bloom often forms a landing platform to attract insects. There is often a hood to protect the flower’s reproductive parts. Orchids grow all around the country, often in poor soil. In the forest, epiphytic orchids grow on trees or rocks. Others grow among leaves on the forest floor. In open scrubland, sun orchids and many others flower in spring and summer. Orchids also thrive in swamps and beside streams. One, called ladies’ tresses, has long pink flowers and may grow in wet sand dunes. Many New Zealand orchids are rare, and some are endangered. The rarest is the black helmet orchid. This grows only in one swamp in the Waikato.